That's my Yoda-esque way of saying the TV lacks picture depth perception. LED-LCD screens often do have this problem, though it can be more pronounced on some than others. That's the case with the Sharp LC-80LE844U. I would say this is one of the flattest screens we've seen in a couple of years. A good plasma TV for instance will look substantially better in this area when comparing side to side. These large Sharp LED-LCDs have very bright whites so they eye-catching in the store. Plasma TVs by contrast look dim as the peak white do not compete. But take the TVs home and put them in a dark room with a colorful movie and you will see a much stronger picture performance on the good plasma screens or the better LED-LCDs that have overcome many of the negative picture symptoms of LCDs. But then if you need that super brightness and high whites for a brightly lit room, especially on football Saturdays and Sundays, then the Sharp LC80LE844U will look very good. In fact, this or a better version of this is the type of TV you are looking for. The lack of picture depth could be overcome in that situation with the Film Mode's smooth motion 240Hz de-judder action. First off, the active 3D glasses we purchased were the Sharp AN-3DG20-B. They are expensive (around $50 per pair – not 2 pair!). They are also uncomfortable, heavy and slip off the nose easily. As a last note, users must use the Sharp active 3D glasses or glasses made specifically for the Sharp active 3D viewing. Sharp has no compact yet with interchangeable glasses with Panasonic, Samsung and Sony. Therefore, Sharp TVs will not sync with the universal glasses or those from other manufacturers. This feature is included on the LE844U however lives up to expectations for poor performance. The 3 dimensional effects are very slight, the picture much darker, and considerable judder and jerky motion elements. It's not a feature you will use much. Color rendition looks good, but just a touch on the unnatural side and with a green push from our fully calibrated Movie setting after 10 point white balance adjustment (see Picture settings on next page). Again, plasma TVs are much better in this area. The LE844U is a Quattron model which means it contains that extra yellow pixel and Sharp's best picture quality. Off center viewing quality is severely compromised in the large Sharp LED TVs. Since the TVs are large there is some leaveway with this issue since there is more physical movement needed to get off center of the TV. From 15 to 20 degrees and on the saturation of colors starts fading and it gets worse the more off center one gets. Of course, on an 80 inch TV it's much more difficult to get off center. But still, this is an issue worth considering especially if the room it's going in has wide viewing possibilities. The long slender remote control has some very tiny buttons such as the Input button located just to the rigtht of the small channels control. It takes a little getting used to finding the small buttons. Even the 5-way controller arrow keys are small which makes browsing and toggling between choices a little slower than normal. The menu broad categories runs across the top of the screen and then down the right hand side for breakdown choices leaving a large area for the content you are watching. The system is not stylish but works well. To get to the important Film Mode setting: Click menu, picture settings, scroll down to the Advanced Settings option at the bottom, scroll down again to the bottom to click on Film Mode. The TV comes with the setting on. For any kind of film based material you will want to turn it off. Turn it off for DVD or Blu-Ray content. 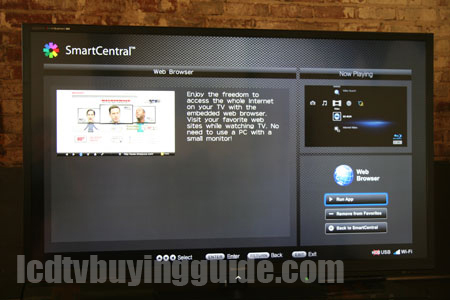 The small Smart Central button on the remote gets you directly to the Internet TV settings. The menu that pops up initially inclueds Vudu HD Movies, You Tube, Hulu Plus, Cinema now, Aquos Advantage Live (support), Vudu Apps,. Netflix, and then scrolling right one time provides access to a web browser, FilmFresh, Skype, USB Media Input, and Home Network. That last one is the favorites section which will change per your choice. Vudu Apps - Provides links to TV shows such as TrueBlood, CNBC, Nova, Discovery, flickr, CBS Nightly News, Facebook. The LC-80LE844U looks different than all other Sharp 2012 offerings with a larger black bezel. It's not too much larger, but it shows due to the super thin framing bezels we are seeing these days. The reason for the 1 inch wide frame and more than 2 inch deep panel is the full array LED backlighting which gives the panel much more control over individual areas of the screen than edge lit LED backlighting. It's a large upgrade feature but helps tremendously with accuracy of color processing on a screen this large. While there are full array LED lighting they are not of the higher end local dimming variety. Dimensions 73-5/16” X 45-3/32” X 17-3/32” with stand. Sharp makes certain to have a large ad for the products listed there. After painfully typing in your search term through the diminutive browser keyboard, click “Done” and then the word you've labored to type in appears in the search bar top right. But your still not done, you must then scroll right to the magnifying glass and again press enter to conduct your search. Then an annoying pop up screen appears “Foresee” asking you to give customer feedback (I'm giving mine here). A few clicks get rid of it. But wait, you're still not done, now you are on a Sharp search page where that your search term has been transferred. You must again click the search button. It took 5 clicks total to get there. Disappointingly, we got 0 results for the term “lcdtvbuyingguide.” Ups. 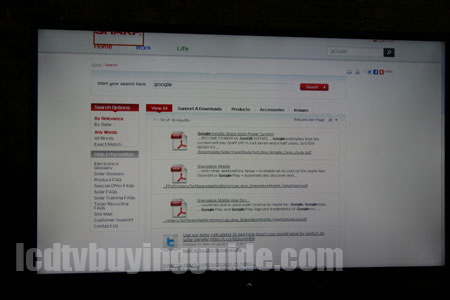 But wait, this is Sharp's proprietary search engine – let's try “Google.” 18 results came up, all PDFs related to Sharp. All with Sharp titles. I'm starting to feel deceived. The first PDF would not open as the MIME type not supported. But wait, isnt this Sharp's search engine. They cant even open their own results? OK, you've guessed it by now – the built in web browser is utterly useless and worthless. Here's what gets me though, when going to the Smart Central options and accessing the web browser there is a screen that pops up that states, “Enjoy the freedom to access the whole Internet on your TV with the embedded web browser. Visit your favorite web sites while watching TV. No need to use a PC with a small monitor.” That's the exact quote. Seems disingenuous. It's similar to Sony's proprietary “search”. It gives us joy to have something so obviously flawed to pick on. Sharp's Aquos Advantage Live is an attempt by Sharp to give some customer service to anyone purchasing a Sharp TV with this feature. Advisors can help with your picture settings, Internet connections, or other issues. It appears that with most of Sharp's higher end TVs the enrollment is free, but it is mandatory that you enroll in the service – there is no question about that. Sharp also says there is membership to the exclusive membership web site and an additional 3 month warranty extension on your product. Well, there is hardly anything to currently compete with this 80 inch TV in size. At $5500 or so it's not an inexpensive option and does not seem to offer the fantastic value proposition that some of the other Sharp sizes like 70” and 60' have. There is a Samsung UN75ES9000 75-inch model due to hit the market soon. It will sell for just less than $10,000 if initial reports are true so I guess that makes this Sharp a discount model.